I've created this nice little beach carnival for everyone to have. It's not immensely detailed compared to what I usually do on RCT2, and it doesn't have any big roller-coasters so it won't appeal to everyone, but overall, I'm pretty proud of it. It looks pretty cool at night-time. The town surrounding the carnival isn't complete either, so yeah, make do with what I gave I guess. 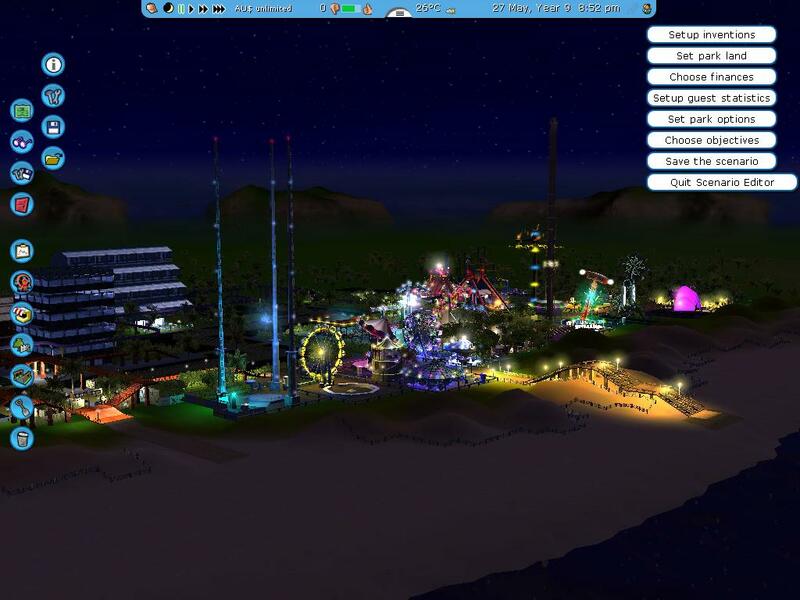 All the rides are complete, the paths into the actual park section I think don't have any faults, so guests shouldn't have too much trouble getting from the entrance to the carnival, and um, all the rides are currently testing so just open them up and you should be set. 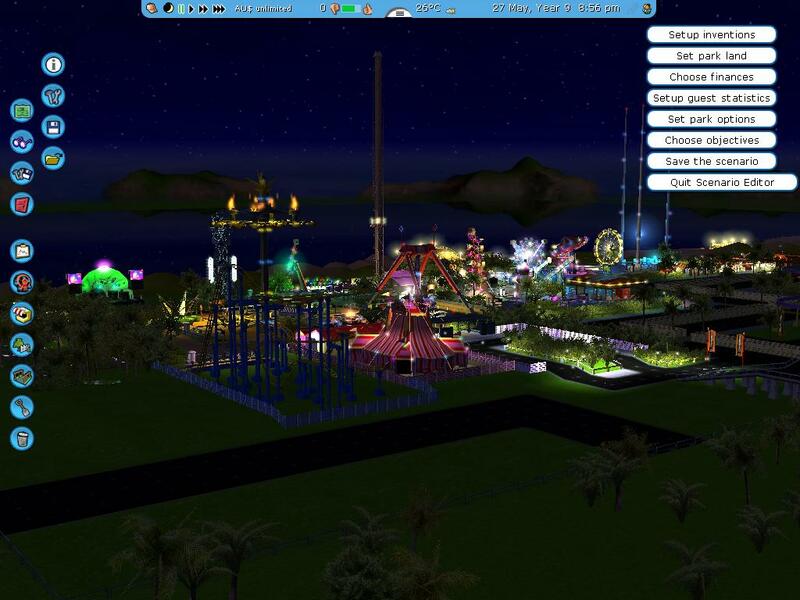 This will appeal more to the carnival loving folk, and I guess it could be fun to re-arrange all the ride positions to tailor the park to your likings Another thing, if this does indeed work, it's not a saved scenario, but rather a scenario in the making, so open it up in scenario editor and you should be set. Meh, if anyone wants this park, feedback would be cool. Wow, How long did this take you? i don't understand what i'm doing wrong, but i download the games, put then in the right folder but it wont work. it has happened with a whole lot of other websites that i have tried but the only ones that worked for me were the coasters off the atari website. What am i doing wrong!!!!! So long as you didn't install RCT3 in the advanced mode, and left all the program folders as they were when you first installed it (eg: when it asked what folder you would like to create RCT3, you just went with what they suggested), here is how to make it work. Save the file into the appropriate folder, or alternatively, save the winzip file onto the desktop, then unzip it (did you unzip them?) and then; Right click on the unzipped file on the desktop and press "cut", or alternatively, highlight the unzipped file and press ctrl+X Open My Documents From there, open the folder named "RCT3" Then open a folder named "Start New Scenarios" (for other types of files it may be different). Place the mouse anywhere in this folder except over another icon, and then right click and select the option to paste, or alternatively, press ctrl+V. Now play the game, and go to scenario editor and open the file from, there, walla! If you follow that guide and it doesn't work, I have no other suggestions.